The Anchorage Assembly voted Sunday morning to extend a declaration of civil emergency for the municipality as the city’s earthquake response continues. The Assembly, meeting in the basement of the Emergency Operations Center, voted unanimously to extend the declaration until Tuesday night. Mayor Ethan Berkowitz declared the civil emergency at 10:45 a.m. Friday in the aftermath of the 7.0 quake that rocked Anchorage. The declaration allows the city to continue running the emergency operations center, call people in to work overtime or outside regular hours and purchase items without going through normal procurement procedures. It also allows the police and fire chief to declare a curfew or evacuate parts of the city, though that hasn’t been necessary. The original declaration was good for 48 hours and would have expired at 10:45 a.m. Sunday if the Assembly had not voted to extend it. At the meeting, Anchorage Fire Department chief Jodie Hettrick also asked Assembly members to use their community councils to send people out to check on their neighbors. As of Sunday, 48 hours after the earthquake, the most pressing infrastructure priorities remain repairing roads that collapsed or were otherwise damaged and fixing water line ruptures caused by the quake, said municipal manager Bill Falsey. 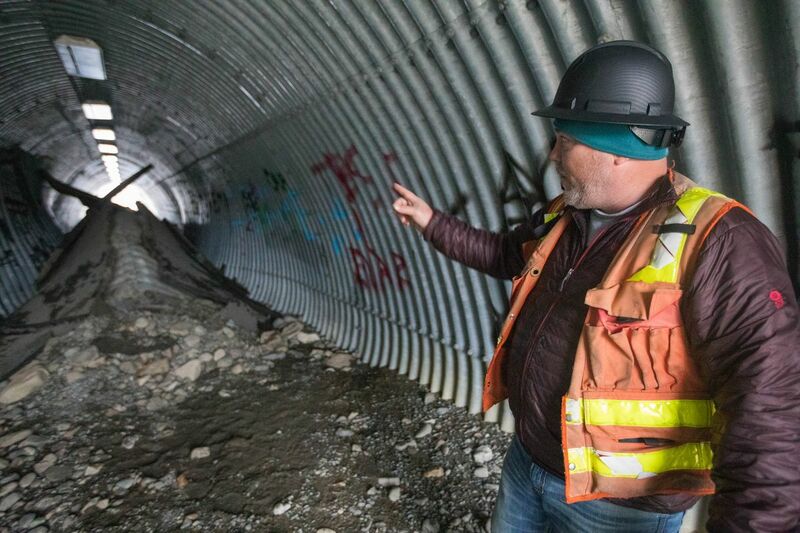 Alaska Department of Transportation officials said Sunday afternoon that extensive “dirt work” had been completed on major damage sites over the weekend. The next step for repairing sites like the Mirror Lake exit on the Glenn Highway will be getting freshly prepared asphalt on the ground, said agency spokeswoman Shannon McCarthy. That’s a challenge because in winter conditions it takes days to prepare the asphalt -- and it’s not quite done, she said. Once the asphalt is ready, paving could start on damage sites like the Minnesota Drive and West International Airport Road and at Mirror Lake as early as Monday morning. A forecast dump of 3-6 inches of snow could slow those efforts, McCarthy warned. Almost all people in the city who lost power have it back, with just a handful of scattered power outages in the municipality. Natural gas workers, aided by contractors who’ve flown in from Michigan, are working through a still substantial backlog of calls for help that once topped 700. The list was down under 300 as of Sunday, Falsey said. Sewer and wastewater systems are functioning normally. On Sunday afternoon, Anchorage water officials ended the precautionary boil water advisory that had been in effect for the area since Friday’s earthquake. The results of extensive testing done on 100 water quality monitoring sites throughout the city should be available by late Sunday afternoon, Falsey said. The Anchorage Landfill and Central Transfer Station are open with no load limit. Drop-offs are free until Saturday, but officials asked residents to bring only what needed to be disposed of, as they anticipate a higher volume of trash. To ease Glenn Highway traffic, Anchorage residents were urged to use the Central Transfer Station. Officials urged Eagle River, Chugiak and Eklutna residents to use the landfill, but cautioned against using the Glenn to access it. Ship traffic is coming to the port as normal, Berkowitz said. “Supply lines are uninterrupted at this point," he said. With the Monday morning commute approaching, the city plans another briefing at 4:30 p.m. Sunday that will focus on progress made on fixing roads ahead of the Monday morning commute and a forecast snowstorm. City leaders again encouraged people to stay home if going out can be avoided. “Just watching Netflix and maybe chilling,” Berkowitz said.